Affiliated colleges. Students are advised to go through the official website http://www.rtu.ac.in/RTU/reap to apply for REAP- 2017 Rajasthan University Admission Process. Date of Commencement of Online Applications is 15/05/2017. Last date to submit online applications without is on or before 15/06/2017. For getting admissions in to Engineering courses, candidate must have to attend the RTU REAP- 2017. 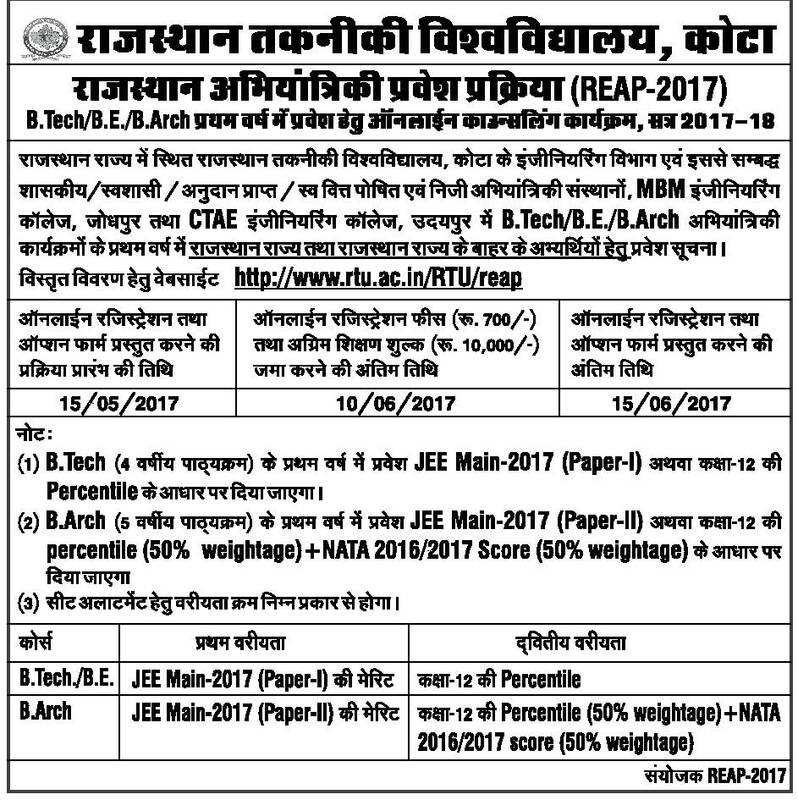 Candidate must have to obtain 50% (depends upon the admission course) aggregate marks are eligible to give Rajasthan Technical University Entrance Test 2017. 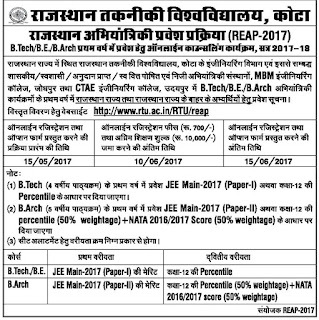 Further details of Registration fee, Application form procedure, Exam Dates, Syllabus & pattern of Rajasthan University REAP 2017 Entrance Exam are given below. Date of commencement of online applications: 15-05-2017. Last date for online application submission: 15-06-2017. Last date for payment of online applications: 10-06-2017. REAP 2017 Entrance test date: Intimated soon. Candidates should have 10+2 with physics & chemistry as compulsory subjects or its equivalent qualification. Candidate must have to obtain 50% aggregate marks are eligible to attend REAP 2017 for admission in B.Tech, B.Arch. See the notification for more eligibility qualifications for taking Rajasthan Engineering Admission Entrance test. Candidate should deposit Application fee of Rs. 700/- plus Bank charges. Candidate need to deposit Rs.10,000/- as Advance fee on REAP-2017 Website, at the allotted institute before last date. REAP 2017 entrance test consists of 40 objective type questions carries 120 marks. No negative marking for wrong answers. The time duration is 120 hrs. Entrance test consists of three sections- Mathematics, Physics, Chemistry and will be conducted in both English & Hindi Languages. REAP Entrance test exam date will be updated soon. Students are advised to visit Rajasthan University official website @ http://www.rtu.ac.in/RTU/reap to apply for REAP 2017 through online. Last date for online application submission is 15-06-2017. Attach the required documents and certificates mentioned by RTU along with filled application form before closing date.